Thank you for your interest in Podex Exchange service! Here is a short manual describing how you can buy virtual coins in your grid. If this is your first transaction we ask you to log in to your world and teleport to Podex office. The easiest way is to use SEARCH option in your world and look for 'Podex Exchange" avatar. Check its PICS tab and find our location. See also the full list of Podex Offices. When you are in the office click the green ATM (see the picture above) and you will be redirected to web page with the form. 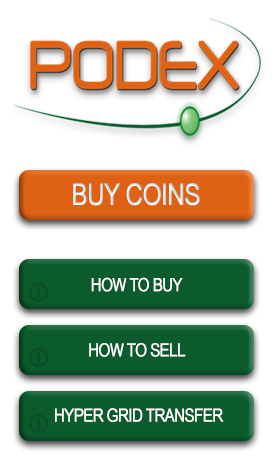 Choose the amount of virtual coins which you want to buy, currency and method of your payment. Proceed to payment page and pay. As soon as your transaction is accepted your avatar will be donated with the appriopriate amount of coins. You do not need to be online to receive them. With every new transaction you can follow the steps 1 to 3 but you can also get Podex Hud and buy coins with no need to teleport to Podex office. 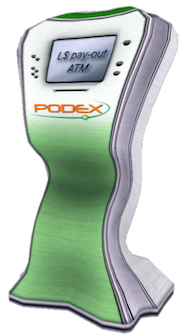 Just click the object with Hud picture and you will receive object called „Podex HUD”. Next time when you want to buy coins find it in your inventory, click with right mouse button and choose Attach to HUD Top right. The hud should appear on you screen. Click it and you will be able to buy coins. After transaction you can detach it from your avatar.